Hello. HELLO. Can EVERYTHING EVERYWHERE HEAR ME?! EE has dismissed claims that its social media staff are attempting to hush fair criticism levelled at the mobile operator on sites such as Facebook. A company spokesman told The Register that it was wrong for subscribers to claim that they were being silenced by EE just for posting complaints about the network online. EE has been recently dogged by claims that it deletes negative posts about the company on its Facebook page and public forum. It certainly seems fair to say that EE has a more buttoned-down social media policy compared with other communications providers in Blighty, who tend to be a lot more chatty with their subscribers when handling complaints. 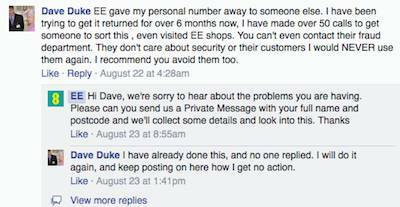 EE, by contrast, appears to routinely ask customers who post grievances on Facebook to take their carping away from a public forum and to instead share details with EE via private messages. El Reg was told that the operator's social media bods do this only where the conversation needs to be dealt with privately because they need access to confidential account details in order to deal with the complaint. Keep discussion of account details private - The sharing of this information can endanger your account security. This includes but is not limited to details of conversations with customer service representatives or transactions on your account. 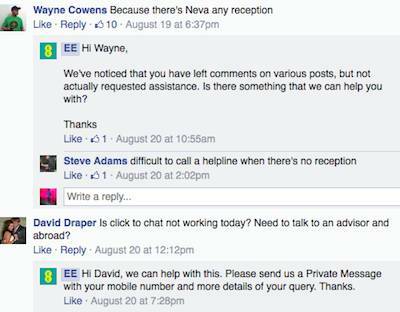 However, it's relatively easy to find customers venting their frustration at EE online. Some have suggested that their complaints are not being picked up via the firm's call centre, which leads them to subsequently moan about that lack of communication on the network's social media pages. But they are then quickly asked to take the matter offline, leaving some customers infuriated by the merry-go-round nature of EE's customer service technique. Ever get the feeling you're screaming into a black hole? Elsewhere on social media such as Twitter, where EE has no control over deleting posts, the company appears - in some instances - to be trying to coax customers away from public tweets. So @EE Is it now your policy to take network complaints offline from public Twitter...? ..@EE Thanks. Complaint sent. Very strange that you don't help with customer service queries and complaints on a Social Media channel. EE's spokesman admitted to the Reg that the operator needs to improve its customer service record. And UK communications watchdog Ofcom agrees: it has received the most complaints from Brits who are unhappy with EE's mobile service compared with the firm's rivals. Worse still, EE has been at the top of that naughty list for seven consecutive quarters. EE's chief Olaf Swantee - who is pumped that EE is Britain's best mobe network - has promised to improve its customer service record by creating over 1,000 call centre jobs in the UK over the next few years. "At the moment we're not number one for service. What we're doing [to fix this] is very real, these aren't just empty words," EE's spokesman said. He agreed, when quizzed by El Reg, that EE could do more to open up relevant conversations on social media - particularly where there are local or national network outages - to help prevent the irritation expressed by some of the firm's 27-million-strong customerbase. "Yes, we are a communication company and we completely take that on board," he said. And how is sir implementing that geofencing idea?